TROY — Three inmates are facing felony charges for reportedly using another inmate’s identification and money to make personal phone calls in August, including one suspect who attempted to make over a hundred personal calls. Devin A. White, 19, of Piqua; Austin W. Schwartz, 22, of Greenville; and Jeremy A. McInturff, 35, of Union each reportedly used the same inmate’s account to make phones while incarcerated in the Miami County Jail, according to Miami County Municipal Court records. White attempted 98 phone calls, but only three of them were connected. White was charged with three counts of fifth-degree felony identity fraud and three counts of first-degree misdemeanor theft on Aug. 10 and was in Miami County Municipal Court on Tuesday for a pretrial conference. A time waiver was filed by defendent. This was also reportedly the fourth time that White had used someone else’s account to make phone calls, prompting jail staff to segregate White from the other inmates due to other inmates wanting to harm White for stealing from them. Schwartz attempted to make five phone calls, but only two of those calls were completed. Schwartz was charged with two counts of fifth-degree felony identy fraud and two counts of first-degree misdemeanor theft on Aug. 10 and also appeared in Miami County Municipal Court this week. McInturff, who is no longer incarcerated in the Miami County Jail, reportedly made 11 phone calls on the victim’s account. McInturff was charged with six counts of fifth-degree felony identity fraud and four counts of first-degree misdemeanor theft. McInturff is scheduled to be arraigned on Sept. 11. White is continuing to be held in the jail on a total bond of $4,500, and Schwartz is continuing to be held in the jail on a total bond of $5,000. A Troy woman received probation this week for reportedly striking two officers during her arrest in June. Misty M. Kraus, 43, of Troy, was sentenced to one year of probation, a fine, and suspended jail time for second-degree misdemeanor obstructing official business, amended down from fourth-degree felony assault, in Miami County Municipal Court on Tuesday. Troy police responded in reference to a disturbance in the area of Branford and Amesbury roads on June 17 at approximately 4:15 a.m. While Kraus was being taken into custody for a domestic incident, she attempted to harm herself and the officers involved, according to Troy police reports. Kraus swung her body and later her head against a police cruiser, at which point two officers stuck their arms in between her head and the police cruiser to limit the blow on her head, according to reports. Kraus then struck their arms. Kraus also reportedly attempted to strike one of the patrol officers with her handcuffed hands and then bite one of the patrol officers. One of the officers tripped Kraus to the ground, where they held her in place until a medic arrived. Kraus was treated at Upper Valley Medical Center prior to being incarcerated in the Miami County Jail until the following day. Jeremy L. Gilliam, 37, of Arcanum, was originally charged with fourth-degree felony theft in connection with a package being stolen from UPS on Industry Park Drive in Piqua on Aug. 24 at 7:40 a.m. Gilliam was found guilty of an amended charge of first-degree misdemeanor theft and was sentenced to two years of probation, a fine, and suspended jail time. • Edward D. Kuykendall, 50, of Piqua, received 180 days in jail for first-degree misdemeanor theft. 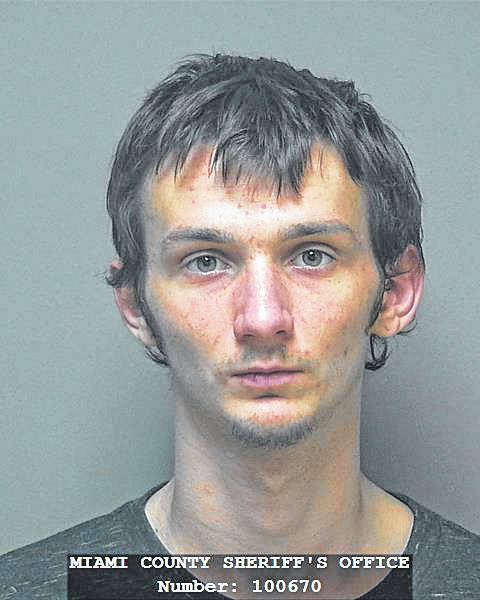 Kuykendall was originally charged in connection with a report of a male subject being found naked on the floor of a bathroom at Walmart in Piqua on Aug. 11 at 5:30 p.m. It was determined the subject had stolen property from the business. • Myriah C. McKay, 28, of Alcoa, Tenn., received suspended jail time and a fine for first-degree misdemeanor possession of drugs, amended down from fifth-degree felony possession of drugs. 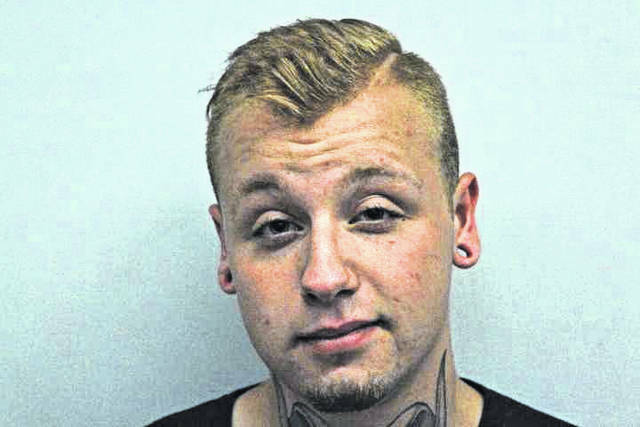 • Thomas E. Maxon, Jr., 21, of Troy, received one year of probation, a fine, and suspended jail time for fourth-degree misdemeanor disorderly conduct, amended down from first-degree misdemeanor assault.